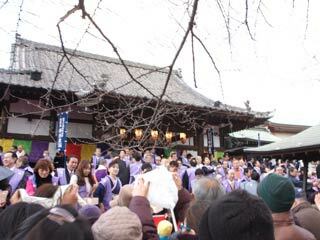 Setsubun at Arai Yakushi Temple (新井薬師節分) is one of popular Setsubun Festival in Tokyo. There is a parade of throwing beans which starts from Nakano Sunplaza to Araiyakushi Temple. Many famous actors/actresses, Sumo wresters and many other Japanese celebrities are invited as the bean-throwing persons. Every year they have different dance performance (2012 had Shishiodori, the traditonal Iwate Dance) and Samurai sword fighting demonstration before the parade. The performance at Nakano Sunplaza starts around 14:00. The Parade starts at 15:00. The throwing-beans happens around 16:30 at Araiyakushi temple. The parade starts at Nakano Sunplaza and finishes at Arai Yakushi Temple. During the parade, the bean-throwing persons throws the good luck beans to the audience. It will be a great opportunity to meet Sumo wresters. In year 2012, they invited Shishi Odori from Iwate prefecture. It is one of the intangible cultural asset of Japan. There is also a Samurai Sword fighting demonstration. Those demonstration are performed at both Nakano Sunplaza and Araiyakushi temple. You can also join as the bean-throwing person.